Why hello there, last day of June. Summer is upon our household. There has been tent camping in Big Bear, splashing in our association pool, park days, free-movie-at-the-mall day and one theater day camp already completed. Cookies baked, plenty of Wii time, signing up for the summer library program (one book a week, they suggest? Puh-lease! We are reading fools over here, me included). What else? Ah! True Blood, thank you very much, Miss Sookie. And, one beach bonfire with a good friend and plenty of nice strangers (more on that one, soon.) One could get the impression that I've been too busy to be in a funk or to get myself into deep emotional waters. Well, one would be wrong. Wrong! Because there is always, always ample time to get myself swamped in dark & mucky emotional waters. Duh. And really, what I want to do this summer is to keep it light on the blog, light and full of photos and brief, pithy, happy briefs from yours truly. But first, well...I just feel the need to purge a little, navel-gaze just a little bit (again). The route to my present state is long and circuitous and involves characters from my past and most definitely my present. But I'll speed us further along that road a bit and just say that, recently I felt moved to re-read some e-mails I'd written to an old friend, spurred by yet another round of weird, passive-aggressive e-mails from a current friend. I sat here at my desk and felt appalled, chagrined and ashamed at myself, for the consistent use of one word, over and over: Sorry. "I'm Sorry!" I found myself writing, so often, so frequently, that I wanted to slap both the past and present versions of myself. Sorry, sorry, sorry...and, "I apologize..."
Good God. I must stop this. Stop it right now. I know all the reasons why I'm such a doormat. I've never attended even an hour of therapy, but hell, I can watch Oprah and Dr. Phil with the best of them. Co-Dependent, and I could list you all the reasons why I feel compelled to be such a Good Girl, Good Daughter, smoother-over-of-ruffled-feelings. It's exhausting, this doormat life. And the flip side of the doormat, underneath all the bending over backwards and turning of other cheeks, is a deep and abiding anger. Anger at others, those others who allow me to grovel and simper and scrape my way out of whatever cul-de-sac of missed cues and miscommunication we've found our way into (again). Anger at the way they can use silence or a turned shoulder to let me twist in the wind, flailing and flagellating and doubting. 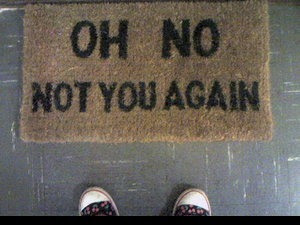 But mostly, of course, I feel the deepest anger at myself, for letting myself become such a doormat in the first place. Well. It's the middle of the year, a long way away from New Years, but time for a resolution. If you're reading this, and feel I owe you an apology for something? Dear ones, my conscience is clear. If there's a book I lost, some promise unkempt, or empty assurance from me that I'd deal with it..but I never quite did? Oh well. I'm just trying my best, best as I can. I'm an honest person, a mostly kind person, and, as I may have mentioned, always quite willing to find fault with myself first and let you off the hook. "But, no more apologies", as Morrissey sings in an old and favorite song. No more easy apologies, unless they are truly deserved and earned. I also need to take a long and hard look at some of the people I call "friend," and work my way through my general mistrust and loner tendencies to be able to forge new relationships, and make my peace with the current ones, flawed though some may be. It is hard to make new friends, good friends, at any age (at least for me). But here, on the other side of 40, it might be near-impossible. But worth the effort. And I don't ever want her to apologize for any part of that. I am so very much with you on this. I've got the same "sorry" problem. Let's keep our resolutions to stop apologizing unnecessarily. Okay, only slightly related to posting: I've just finished True Blood season deux. Didn't like it as much as the first season . . . until the last two episodes. Jason Stackhouse as an evangelist just killed me. The preacher's wife: "You're worse than Jeremiah!" Jason: "Why? What'd he ever do to you?"